We’ve received numerous comments on our website and lots of emails from people asking questions about our teaching jobs in China. 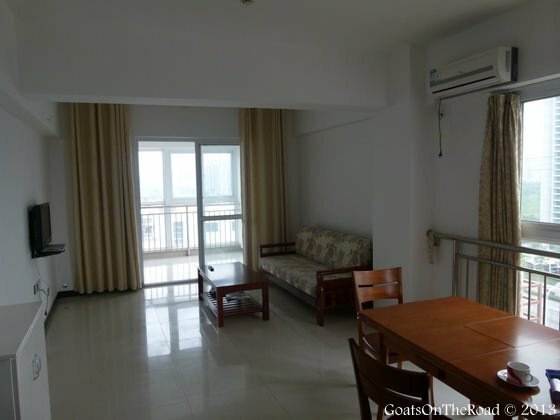 How were we able to live comfortably in Yangzhou, China, while saving enough money to travel after working for a year? When we say we saved $21,000 while teaching English in China, most people assume that we must have lived a very basic lifestyle. Not only did we live well, but we had great experiences, met amazing people and had wonderful students. I figure it’s time to breakdown our lifestyle in China compared to how much money we earned (and spent) there. These figures are all based on a couple’s salary and living expenses in China, and are in US Dollars. *Note: If you need money sent to you while you’re living in China, check out this TransferWise Review and see if it’s right for you. It was fully furnished as well. The apartment had a flat screen tv, a bed with mattress (a very hard one), end tables, armoir/wardrobe, a futon couch, kitchen table with 4 chairs, some pots, pans, bowls, a kettle, rice maker, hot plate and…chopsticks! Cost of apartment: $364/month (including monthly rental fee). The school covered $266 of this amount, meaning we spent $98 / month on rent. 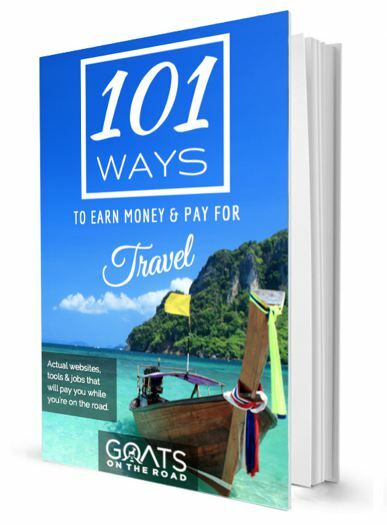 Want to earn and save even more while living overseas and travelling? 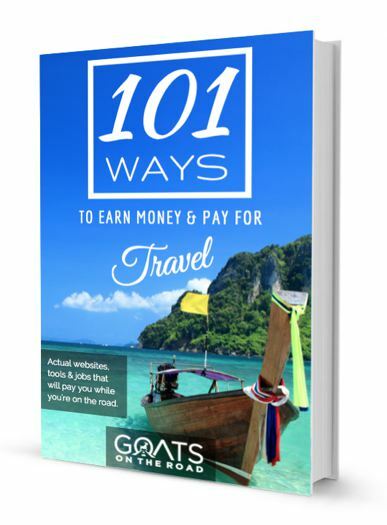 Check out our epic list of 101 Travel Jobs, learn how to find work, how much each job pays and what the work entails. 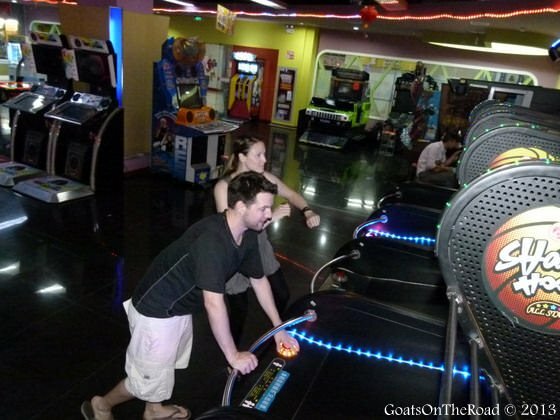 Our idea of entertainment may differ from that of other people. For us, our main form of joy was drinking red wine paired perfectly with aged cheddar! This is our kind of entertainment! Our modest collection on the counter. If we decided to go out, it wasn’t about the bars, we loved going out for dinners with a big group of friends. We also would have parties at our house or get friends together to watch a UFC fight. In the summer, we had BBQ’s at our friend’s house as well as pool parties. Oh how we miss Chinese food! They may eat some seriously strange foods there, but there are so many other delicious meals as well. We ate dinner out at restaurants 3-4 times a week and typically made breakfast and lunch at home. Our cupboards and refrigerator at home were stocked with western foods. 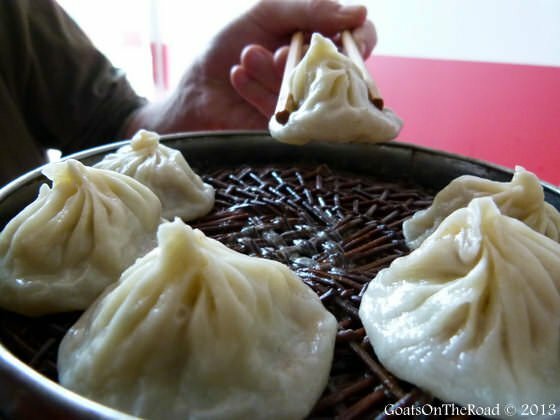 Yes, we ate a lot of dumplings, but not because they were cheap…we love them! And yes…we ate a lot of dumplings! If we were going further outside of our neighbourhood, if it was raining, if it was cold, or if we were lazy, we wouldn’t hesitate to take a taxi. At the bar in Yangzhou, we went there only 4 times in the whole year! At the train station, ready to go to Suzhou! Our goal was to have enough money at the end of the year to go on a backpacking adventure through Mongolia, Russia, Central Asia and Iran, and we’re fortunate to have been able to achieve that goal. Teaching English is an excellent job for anyone who loves to travel and is interested in learning about new cultures. It’s also great if you want to save lots of money in a year while working minimal hours and having lots of free time! 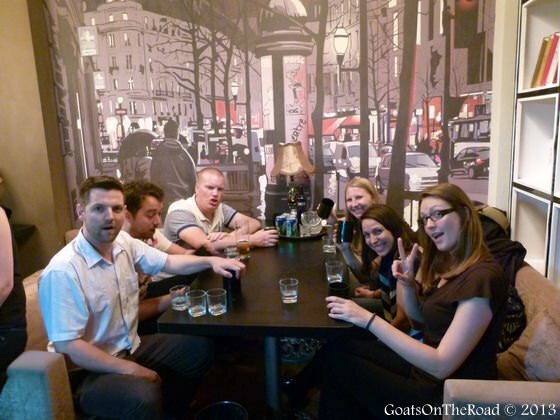 10 Reasons Why Living Abroad Is Awesome! Have you ever taught English abroad? Were you able to save money as well? Share with us below! I’ve been teaching in China for a little over a month and I can already tell I’m gonna struggle to save money like y’all managed to. Saving 21k?! That’s impressive. Nice breakdown of expenses – I’ll try emulate your spending from now on. If you really want to save money, then you totally can. 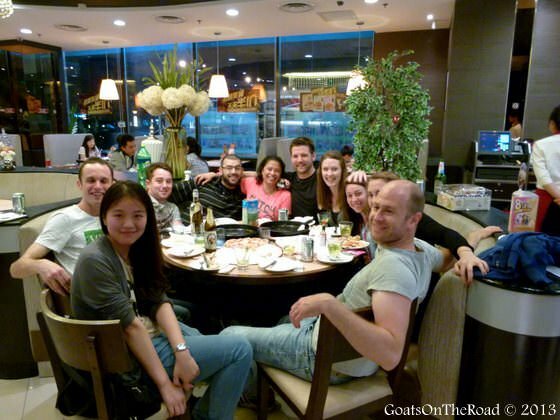 However, if you don’t really have a goal of saving money while in China (which many people don’t), then it’s very easy to just spend all of your earnings on nights out, drinking, travel, etc. – which can all be great as well. Good luck with the savings. Great breakdown, and really useful! It’s good to know you can live comfortably and still save in China: from EFL jobs I’ve seen there (which is not a huge number and I haven’t looked for a while), it seemed you could only do one or the other, not both! Thanks Sam. 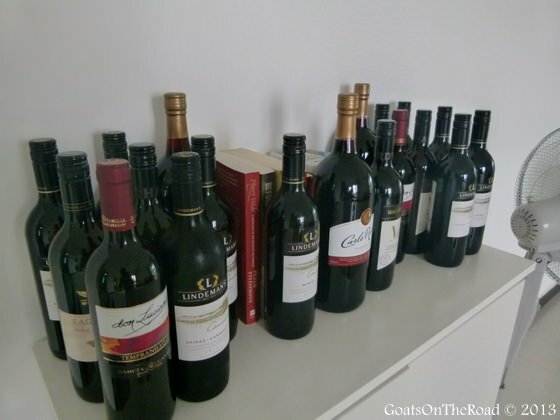 We really found that we could live comfortably and save money. If you were to teach in Japan or Korea, it’s possible to save a lot more than we did! Great breakdown. I’m always interested in seeing how others are living aboard, how much it costs, and what they were able to save. It’s really helpful for trying to figure out where would be the best country for me to teach English in. Thanks Kimmy, glad we could help. Teaching English is a great job, we loved it! Nice! I have a blog post about how we saved $20,000 in 1 year living and working in Canada. You guys definitely lived more comfortably than we did. 😀 I wonder if you’d be able to save as much if you were to live in another city. I’m not very familiar with the cities of China, but I’m guessing Yangzhou isn’t as expensive as Shanghai or Beijing? Thanks for the comment Deia! Well done saving $20,000 working in Canada. Where were you living? You’re right, living in Yangzhou is definitely cheaper than living in Beijing, Shanghai, Chengdu or another bigger city. In some cases, we’ve heard of schools paying English teachers more to live in the more expensive cities…in other cases, they’ve paid less because the jobs are so sought after in those places! We lucked out though and really enjoyed Yangzhou, lived comfortably and were able to save some $$. I see, so that’s where luck comes into play. 😀 I was in Richmond, BC. It’s really good you made that commitment and stuck to it. 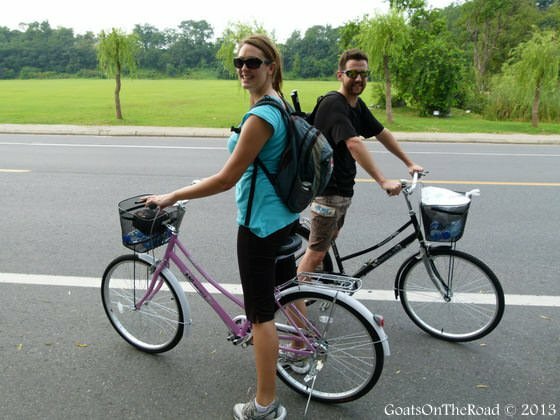 When poi and I lived in Thailand we ended up spending a lot more money than we planned! We loved ever minute of it but we weren’t se to save anything! haha, ya, that can definitely happen…especially in Thailand 🙂 But ya, we had a goal and we really wanted to save money, enjoy our time in China and have enough money to travel as well. We’re very happy that it all worked out. Thanks for the comment Kirsty, happy travels! You guys are saving pros! 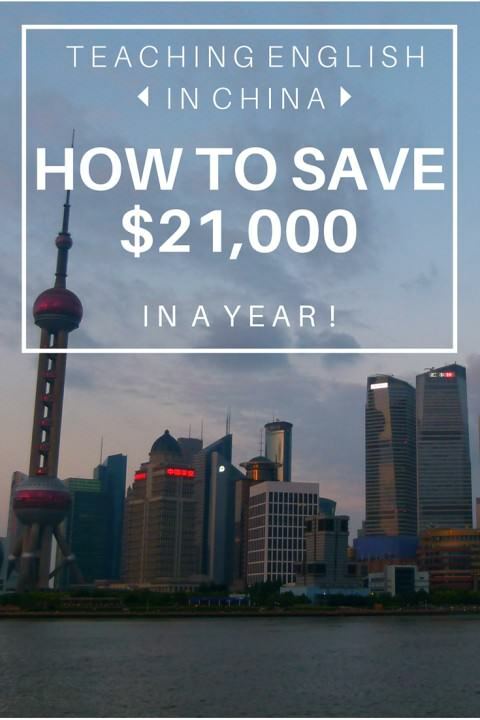 We found that it was much easier for us to save when we lived in smaller Chinese cities, even though we make more money now living in Shanghai. There are so many more temptations here between western restaurants, bars, and events, and we don’t want to miss out on all the fun! We’re still trying to find a balance so we can experience all that this incredible city has to offer but still save enough to travel. This article was a good reminder on ways we can save more. You’e absolutely right, there are so many more temptations in the big city! I think if we had more western restaurants, concerts, shows, bars, etc. in Yangzhou, then we wouldn’t have saved as much money…or at least it would have been harder to. Also, great point about not wanting to miss out on all that the city has to offer, otherwise, why are you living there, right? I think it’s important to find a balance. Saving as much money as we did may not be a priority for many people. For us, we really wanted to go on this 5 month trip and have a bit of money left in the bank, so we tried hard to reach that goal. So, enjoy all that Shanghai has to offer, but maybe sometimes you can stop to think “hmm, do I really need to buy this?” haha. That’s amazingly detailed. I can’t believe you were able to live so comfortably on so little, it really puts things into perspective. Great article! yes, it really does put things into perspective. We (as people) really don’t need as much as we think we do. It’s possible to have great experiences and make wonderful moments without purchasing unnecessary things. I’m thinking B about teaching English in China but I was kinda worried about my expenses and how much money I can save. But after reeding this, it should not be impossible. Great! Saving money in China while also having a great time is definitely doable. It can depend on where you will be living though. If you’re in the bigger cities, there will probably be a lot more temptations! (concerts, coffee shops, bars, etc. ), but if you have a goal to save money, then just put a limit on how much money you spend a month on entertainment and you should be able to save. Good luck and enjoy China! 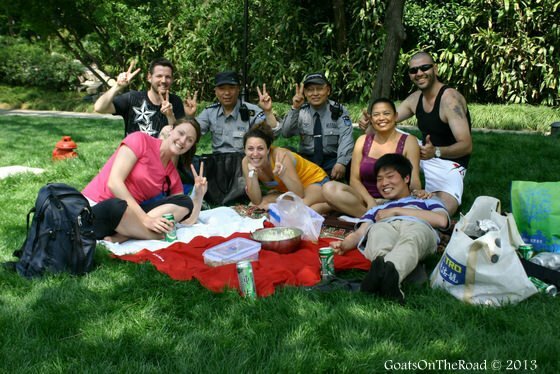 Sincerely, Glad to hear that you guys experienced a great year in China and save some money for your goats’s dream. It’s so funny because when I read your stories like this, it hits home because we exactly where you were a couple years ago! Almost a year ago we decided we wanted to explore the world while we were still young enough to do it. Our current jobs are exhausting, and we realized that we would never get to see most of the world anytime soon only having a few weeks of vacation a year here in the States (and it would cost a lot with all those flights)! We decided to make a plan and give ourselves just over a year to save up, get our affairs in order, sell our belongings, quit our jobs and head out! While we will have money saved before leaving, we knew we would want to make money while traveling so we wouldn’t have to dip into our savings. So we decided to look into teaching abroad for a year – probably China! We also launched a blog to help out as well and see what we could make of it. The thought of being able to travel the way we want to, actually having time to work on the blog, and making money by teaching English sounds like a win-win-win. But of course, it’s scary to think about quitting a stable job to take such a risk! So your posts have been so helpful and comforting – to know that we aren’t the only ones with this crazy idea…and that it can be accomplished! We only have 4 months to go – so as we get closer, we get more excited…and nervous! We love following you and all the awesome information that you provide! Teaching English is definitely an option for making money. As you can see, we were able to save quite a bit! The countdown is on! Let me know if you have any questions. Thank you for the article. I am wondering WHERE all the details are if so many people are doing this. It is a dream I have had for 10 yrs to return to China. I fought before right after high school for semester as a volunteer. I would love to re-explore that wonderful place but make money at the same time this time around. With that in mind, did you know any couples who had kids? I have a wife and a 2yr old. My wife also taught previously as a volunteer, but we would likely be living on one contract with teaching on the side to supplement. We can also rent out our house for about 500$ income a month, and are hoping to live mostly on that so as to save at least 1000 a month. Doable? Friends of ours taught English in Nanjing and they had a 2 year old, they are still there. Moving to China is doable with kids but I think you may need to be more picky about where you live. If you’re in a westernized city like Shanghai, Chengdu, Beijing, Nanjing, etc. there are more amenities, items for purchase and proper healthcare. Nick and I lived off of about $1,300 USD a month. We ate well and had a great time, but we were also in a smaller city. If you’re in Shanghai or another westernized city, the cost of living will be higher – although, your pay may be higher. Living off of $500 for a family would be very difficult. If you only eat at cheap Chinese eateries, buy only local groceries, have your apartment fully covered by the school and cycle around the city, that will save a lot of money. True China is somewhere to save money; work will pay for your accommodation/apartment, they will pay for your flights to get there, and they will even give you a cute looking translator (hahaha). My work gives me everything, that is food, apartment, car, flights, i pay for nothing (except when i go out with friends) because they even do the great Chinese drinking culture of drink with bosses (so alcohol is free even). And at the moment the salary is much better in China then any western nation, and the tax lower then my country in Australia. So agreed i save in China, and most expats would save similar amounts in professional jobs. Average salary in Australia is maybe 65,000 but most that gets lost in tax, then rent ect… but in China your average salary of an expat is much higher around 80-100,000/yr (suggested by some expat sites. But then in terms of spending power – a salary of RMB 5,000 per month (approx. USD 800) is said to allow for the same kind of lifestyle that a salary of USD 2,500 per month could provide within the United States. So your considerably better off even if you were given the same salary in China as back home (but thats not normal, as China usually pays much better to encourage professionals and experts to come with their skills). Have really enjoyed reading through your various articles, etc. My husband and I are starting to see some light at the end of our tunnel…I am selling my business, we may sell our house or rent it out, etc. Once that is all settled we will start planning some short trips and then hopefully long ones. Its been a long time since I travelled long term and its extremely comforting to see all the articles and stories that remind me that it is possible and we are not crazy for wanting to trade in our daily responsible grind for something different. I taught in Japan for a year in 1997 and saved 20k USD . It would have been much more, but the exchange rate became less favorable while I was there. I totally agree that living in a more rural area with fewer big city temptations made it easier to save. I hiked a lot, but rarely shopped because there was not any shopping near by. It was an incredible experience. Now that I am married and we are both interested in the travel lifestyle you guys will be my go to resource. I am pretty outgoing and have no doubt everything will be great. My husband is pretty introverted and I am hoping he enjoys the traveling and meeting new people and learning about other cultures as much as I do. Thanks for all the info and ideas! Good luck to you both – I’m sure your husband will love it, how could he not? Great motivation that you can still live a good lifestyle and save money. I taught in Chile for 2 years it gave me the opportunity to travel around, go out, and enjoy a nice lifestyle. Excellent. Chile is supposed to be a beautiful country. Which city were you in? We can’t wait to visit! I am going to China in September to teach English, however I am having a hard time finding a reputable agency to go with. Any suggests on where I can start. We will be looking to save as much as possible also. Nice to see your break down. this is a very good information on how to save for travels. I wish I can do the same. Great job! thanks for sharing. Thanks Ruby 🙂 We really prioritize our spending and find that most things really aren’t necessary! Teaching was a great way to save some cash. I am looking to travel to China after finishing my bachelors degree in global studies . I am curious if the rural areas of say, Yunnan, pay well enough to save money. Thanks for the information! You’ll have to check out job postings though to see what each school in each city would pay. P.S; I’ll have roughly 5K saved upon my departure… Think that should be enough? Also; any tips in finding an apartment? The school is going to pay 3000 RMB of the rent. 5K is a great amount to start off with. You’ll need to pay for some things like cell phone, internet for a whole year upfront. 3 months worth of utilities, etc. Your school probably won’t pay you for the first month (back-dated), so you’ll be good to go with 5K. The school should help you find an apartment, but my advice is to not choose the first one you see (unless you love it). remember, you’ll be living there for a whole year! We stayed in a hostel for 4 nights before choosing our apartment. Hi! 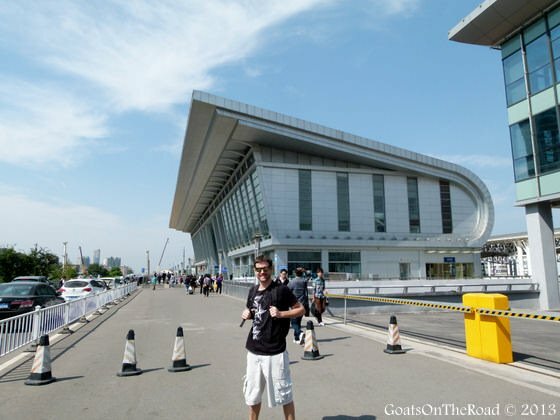 Great article I am also going to yangzhou do you have any good areas where I can live? Regarding rent, how would the process work do I have to pay an initial amount such as first month deposit or such and then upfront cost? Would you recommend me going for an apartment that has a broadband with it? That’s a deceptive click-bait title. Funny how you clarify in your second paragraph that it was a “we”. WE do all of our posts and money reports as “we”. I’d say earning 10,500 as a solo person in one year working 20 hours/week is pretty amazing as well! My goal is to teach, gain experiences, and save money. Is there any information about reputable recruiters or how you went about getting a job that allowed that kind of saving? Good day, thanks a lot for sharing your experience with us! I was wondering if the wages you make in China are somewhat tax-exempted. You may reply to me by email should you wish. Also, my first language is not English, however I have been living and working in an English speaking country for over 10 years. Would you think that is acceptable? Last but not least, do people ask you personal questions at work? I’m gay but usually not open about it. I like to keep a low profile and blend in. I do not like to lie either. Anyway if you can provide any insights into it, I’d appreciate it. I havent seen the salaries? I would like to know bcoz i am thinking to go to Beijing for 25k rmb per month with free apartment. I am looking forward to your reply. 25K / month is good, depending on the weekly hours. The rough going rate is 10,000 rmb / month for about 20 hours work. What city were you living and teaching in? That makes all the difference in your spending and saving amount! Thanks for the comment. That post has been on our site since 2013 and not once did I realize that it doesn’t say the city we were living in! Sorry about that. It was Yangzhou, which is about 3 hours from Shanghai, near Nanjing, in the Province of Jiangsu.